A recent email exchange with my friend Lauren Zalaznick and Gloria, her 90 year old mother, got me thinking about how many wonderful memories and stories revolve around families cooking and eating together. The recent post on this blog, The Story of the Shvartze Skovoroda, is just one example of this. I had asked Lauren if it would be okay to her mom to write a guest post for this blog, and her suggestion was to do a Q&A. The result of this colloquy is The Madeleine Questionnaire. which you can take below. A madeleine is a shell shaped French cookie. You can find them in lots of places now, including your local Starbucks. The cookie is famous for having set in motion Marcel Proust’s three volume novel, A La Recherche du Temps Perdu, commonly translated as Remembrance of Things Past, but more literally In Search of Lost Time. The text is set in motion by the narrator’s childhood sense memory of the petite madeleine’s smell and taste. We got to thinking that many of us have these origin stories, these archetypal moments that mean something to us and help shape us. Let’s give some prompts so that we can get a sense of the richness and variation of these memories. I invite you to take The Madeleine Questionnaire. I hope that it brings back a flood of good memories for you, including the tastes and smells of your past. If you choose to take the questionnaire, you only have to answer the questions you want to. And, please remember to scroll down to the bottom of the questionnaire and hit Submit, so that your answers are saved. 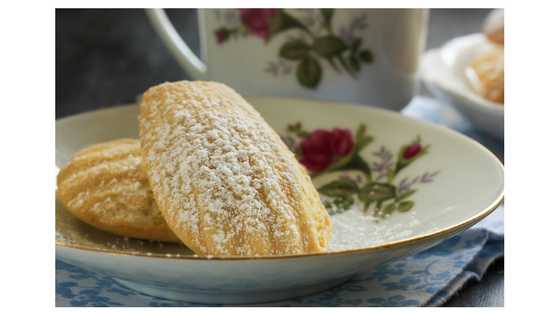 As the stories are told to us through The Madeleine Questionnaire, we’ll share them with you. Even if you don’t answer any of the questions in writing, maybe you’ll have a few moments where your memories are jogged and you get to recover a taste, a smell, or even a feeling that is from and of your past. Now that you are thinking about those old memories, grab that recipe card box you inherited. Look through those recipes and see what memories the evoke. If you still have some time left over, add a few to ReciFoto!